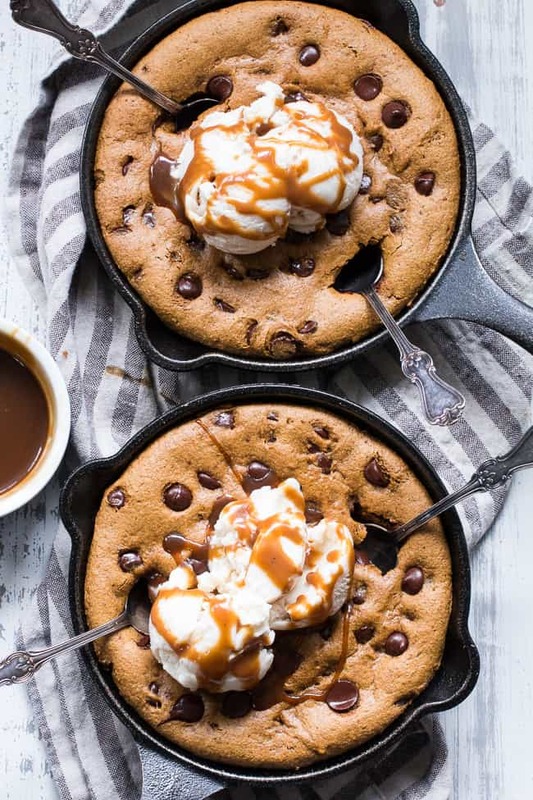 This fudgy gingerbread chocolate chip skillet cookie is out-of-this-world delicious. 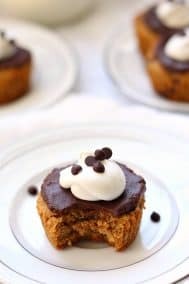 Made with coconut flour and almond butter for the perfect dense, chewy texture, spiced just right and sweetened with coconut sugar and molasses. Coconut vanilla ice cream and dairy-free salted caramel to top makes this dessert perfectly decadent for the holidays or anytime! I almost gave up on this gingerbread skillet cookie. 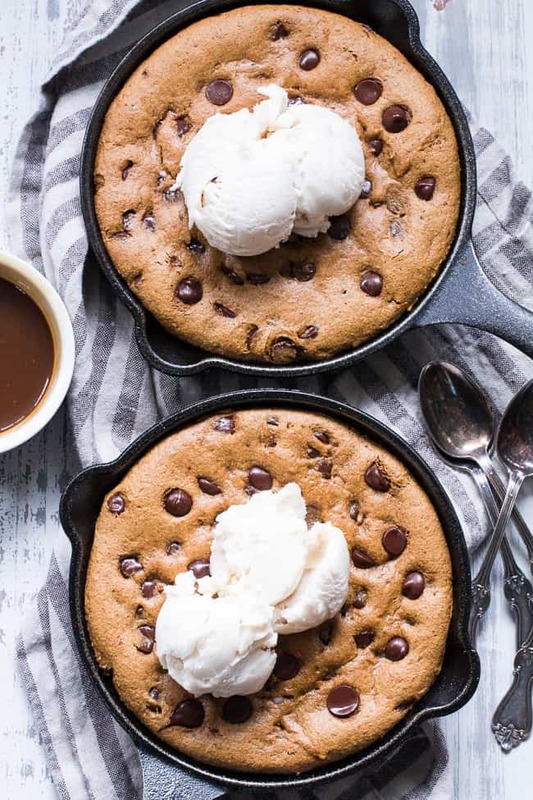 You see, I had my heart set on this skillet cookie being nut free, in addition to paleo. 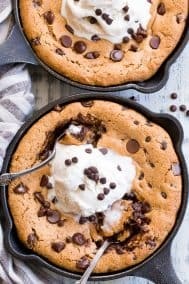 I figured that I could base the recipe on my coconut flour chocolate chip cookies, and we’d all ride off into the sunset baking the most delicious, fudgy, gooey, nut-free gingerbread skillet cookie in the history of all skillet cookies. But, um, no. Instead, I baked 3 nut free skillet cookies that just didn’t make the cut. Were they all terrible? The first one was, that’s certain. But even though the third wasn’t exactly terrible it also wasn’t worth it, in my opinion. And when we’re using high quality (pricey!) ingredients, it should be WORTH IT! I don’t like handing out mediocre recipes if I can do better. Enter almond butter – and we did better! The good news for those of you who need to be nut free though, is that sunflower seed butter can be used here as well to get the same texture. Beware of sunflower seed butter turning the inside green after baking/cooling though – it’s a chemical reaction with the baking soda – and it’s totally safe – just weird looking. 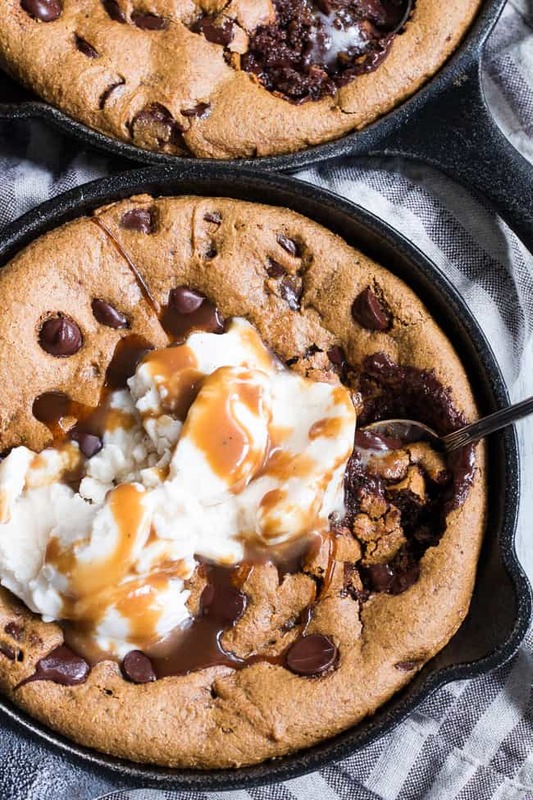 For the rest of us nut-butter consumers, a big THANK YOU to almond butter for allowing this skillet cookie to happen, and saving my sanity for the week! The other big change I made to the recipe that brought it from “yum” to “wowwwzzah!” was adding dark chocolate chips. I originally wasn’t sure I liked the idea of chocolate with gingerbread, until it dawned on me that I made these gingerbread chocolate truffles last year that were ridiculously good! 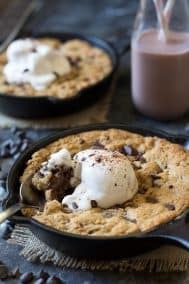 The chocolate adds a nice gooey, fudgy texture to the middle of this skillet cookie that takes it to the next level, if you ask me. As it turns out, gingerbread + chocolate really do belong together, and I’m so sorry I ever doubted it! Dynamic duo for the holidays – heck yes!! 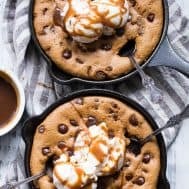 This skillet cookie bakes REALLY fast – especially when you use 2 smaller skillets like I did – so be sure to watch for doneness so you get that nice gooey middle! It’s ready when the sides puff up and the middle appear just set – about 14 minutes for small skillets and 15-18 for a larger one. Between the quick baking time and the fact that you SHOULD serve this warm (no patience necessary!) you can be devouring this dessert within about 30 minutes from the time you start! 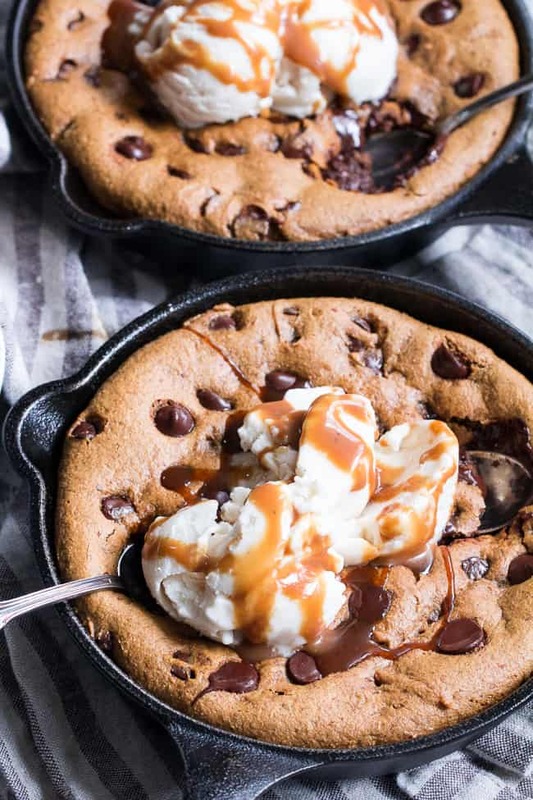 Gotta love a good skillet cookie to avoid that whole annoying “don’t touch while they cool” issue that comes with baking regular cookies or bars. In addition to that actual cookie, I had to decide on serving toppings. 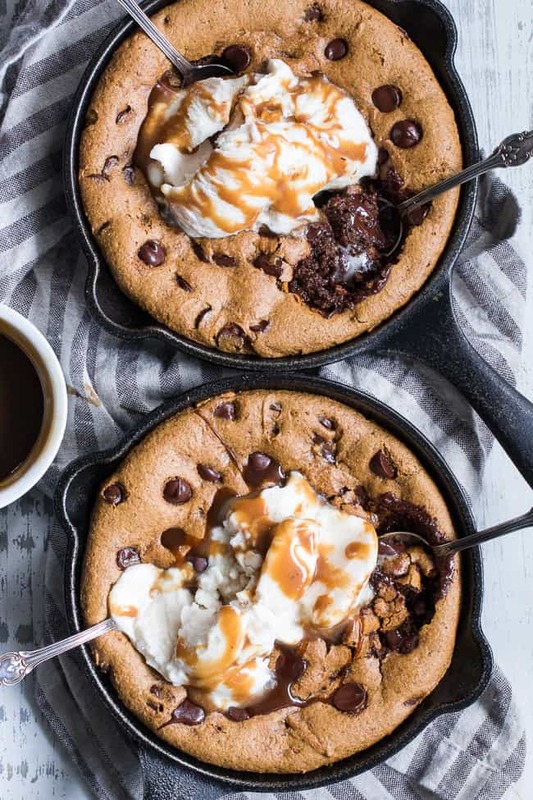 Again, toppings are just another factor taking this skillet cookie up a notch! I went with coconut vanilla ice cream and my salted caramel sauce – which you might’ve noticed I’ve been using a whole lot lately! If you haven’t tried it yet – now is the time – and if you have, then now’s the time to make it yet again. Are you guys ready to get cozy with your skillet?! 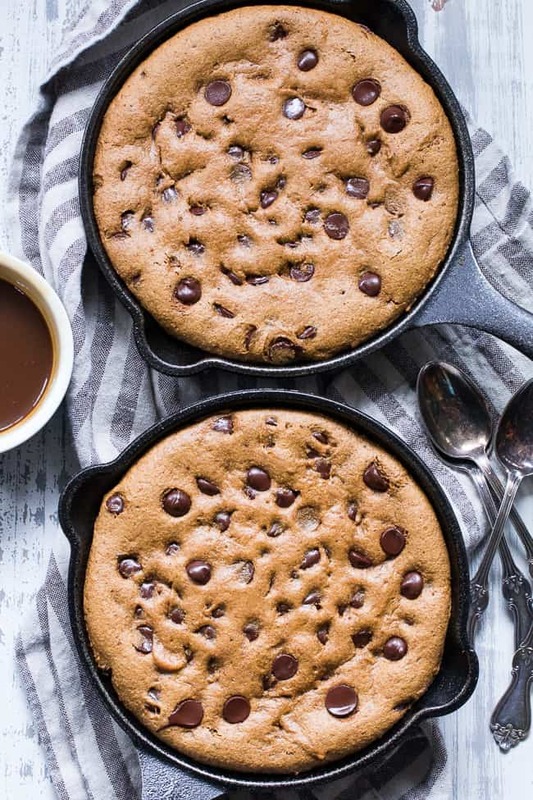 Get the oven preheated and let’s BAKE this chocolate chip gingerbread skillet cookie! Preheat your oven to 350 and lightly grease a 9-10" cast iron skillet, or 2 6" skillets with coconut oil. In a large bowl with an electric mixer, combine the egg and egg yolk, coconut sugar and molasses until smooth. Add in the almond butter, coconut oil and vanilla and continue to mix until smooth. In a separate bowl, combine the coconut flour, tapioca flour, baking soda, salt and spices. Add the dry mixture to the wet until a thick, sticky dough forms, then stir in the chocolate chips, leaving a small handful to sprinkle over the top before baking. Spread the dough evenly in the skillet(s), smoothing the top, then sprinkle remaining chocolate chips over the top. Bake in the preheated oven until sides puff up and middle is just set, 12-14 minutes for 2 small skillets and 15-17 for one large, do not overbake, watch for signs that they’re done! Serve warm with coconut vanilla ice cream and salted caramel sauce, if desired. Enjoy! **Get my recipe for salted caramel here. Want More Paleo Holiday baking recipes? Try One of These! Made this tonight and my kids went wild for it! I don’t think I’ve had gingerbread and chocolate before, but it’s delish! So happy you guys loved the combo! New to me too, but I’m hooked! Coconut flour can be a real pain in the you know what to work with! Thank goodness for nut butters. Yes nut butter saves everything! Can’t wait to make this! Can I use maple syrup instead of molasses? My husband just got diagnosed with severe allergy to almonds. Can have all the other nut butters but not almond. So now I have to replace all my recipes that use almond flour with another flour. I’d love to try some of your cookie recipes, do you have a suggested gluten free flour for substitution? Thx Michele! I finally made this tonight ; WONDERFUL! Woohoo! So happy you liked it! I made this tonight. It was delicious! I love that your recipes are yummy and made with healthier ingredients! I’m curious, is this recipe gluten free? Do you think I could switch out the coconut sugar with a banana as a sweetener? And is the tapioca flour required for this recipe? The texture would definitely be affected but it’s worth a shot. The tapioca makes it chewier but it’s not essential. Would I be able to substitute anything for the tapioca flour? That’s not something I usually have on hand.